Four boats carrying 47 pro-Palestinian activists will be welcomed with letter from PM: ‘It looks like you took a wrong turn. Perhaps you meant to sail to a place not far from here – Syria’. 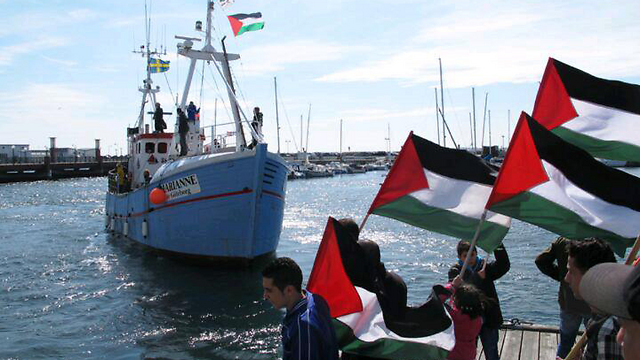 The flotilla on its way to Gaza. The Navy has been preparing to meet on Monday a flotilla carrying 47 pro-Palestinian activists to the Gaza Strip in an attempt to break the Israeli blockade. The Navy commandos are expected to meet the four boats at an undetermined time – sometimes between the early morning hours and evening time, some dozens of kilometers from the coasts of Israel. There are 18 passengers aboard the main boat, Swedish vessel “Marianne av Göteborg,” including Joint Arab List MK Basel Ghattas, former Tunisian president Moncef Marzouki and activist Dror Feiler. The “Marianne” is accompanied by three smaller boats: “Rachel,” with eight passengers on board; “Vittorio” with nine passengers on board; and “Juliano II” with 12 passengers. The commandos will try to take over the boats using non-violent measures and lead them to the Navy base in Ashdod. After the takeover, the activists will be taken for questioning upon their arrival to Israel and then expelled out of the country through Ben-Gurion Airport. The Prime Minister’s Office decided to take an unusual approach to the flotilla’s arrival. “Here in Israel we are dealing with a reality in which terror organizations like Hamas are trying to harm innocent civilians. We are protecting the citizens of Israel against these attempts in accordance with international law,” the letter continues. “Despite this, Israel is aiding in the transfer of goods and humanitarian aid to Gaza – some 800 trucks a day, which transported over 1.6 million tons of goods over the past year … Israel is aiding hundreds of humanitarian projects using international organizations, including building clinics and hospitals. The IDF, meanwhile, said the flotilla was an attempt at provocation and that its troops will not fall into any traps. The commandos taking over the boats will offer the activists food and drinks, the army said. As a lesson learned from the takeover of the Mavi Marmara flotilla in 2010, the commandos will document the takeover and the IDF Spokesman’s Office will work to quickly distribute the footage to world media before the activists could post a “victory picture” of their own. Naval special forces take control of ship, which carried 20 activists including MK Basel Ghattas, without violence.